The Continuous Run Tank allows higher than normal liquid levels to pass through the system without interrupting the suction flow. This means your dry vac will never stop to drain the tank. 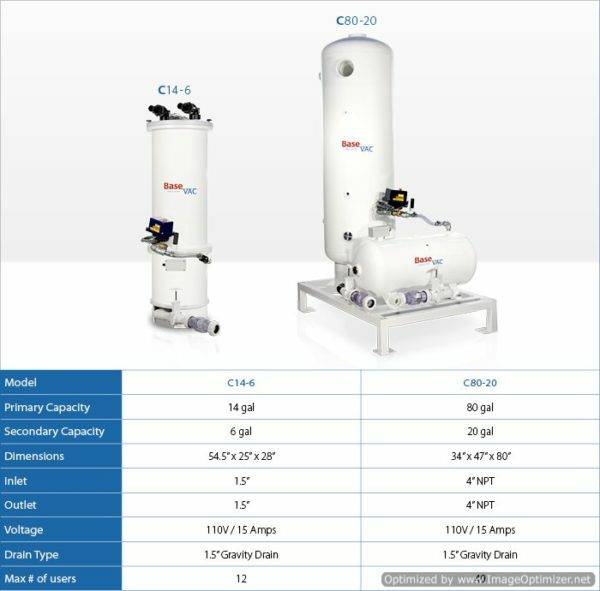 Continuous Run Tanks are designed to work in conjunction with the BaseVac HD Series and Custom Systems. The unique design provides two separate tanks; one always running, the other drains when full. The Continuous Run Tank allows higher than normal liquid levels to pass through the system without interrupting the suction flow. This means your dry vac will never stop to drain the tank. Continuous Run Tanks are designed to work in conjunction with the BaseVac HD Series and Custom Systems. The unique design provides two separate tanks; one always running, the other drains when full. The extra capacity speeds up the process of cleaning the line at the end of each shift. In fact it can even happen while you are still operating. 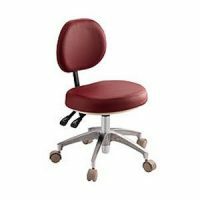 Engineered to keep your clinic working all day with no vacuum interruptions. Great for the environment, and great for your budget. How is it that traditional Dental Dry Vacuum Systems exhaust oil into the dental environment? Lots of expensive oil leaks into the environment over the life of a traditional system. Airborne oil vapors are unnecessary environmental hazard that is totally eliminated with he BaseVac Dental Dry Vac. 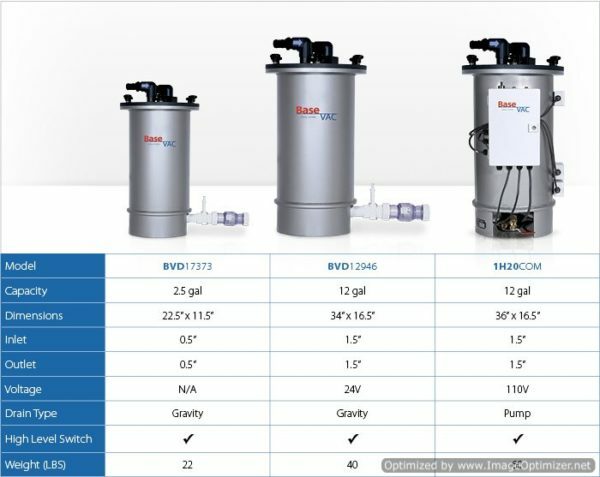 BaseVac Dental Systems use a technically advanced oil free rotary vane vacuum pump as the powerful heart of the dental vacuum package. The wear components are designed to exceed 8,000 running hours before they need to be replaced. The patented composition of the self lubricating carbon vanes means they will not be affected by the potential moisture in the system. The unique BaseVac carbon vane compound is designed for long lasting and very, very quiet wear. Oil free means environmentally responsible, just the second step in BaseVac dental’s commitment to the environment. Why are the liquid ring vacuum pumps used in dentistry? They are inexpensive and the liquids gathered pass through the pump and down the drain. Down the drain with thousands and thousands of gallons of water. Water you pay for twice; once to drive the pump and once as sewage. Communities throughout North America are legislating to stop the waste of water required to create vacuum in dentistry. The environmental benefits in reduced water sewage, you benefit in no water costs. Zero water was the main criteria for BasVac engineers in designing the world’s most compact, quiet, powerful and environmentally smart dental vacuum system. The pump is 100% dry running, using unique self lubricating carbon vanes working at vacuum levels five times the required minimum. Zero water used in the creation of vacuum, zero effect on municipal water demands and no increase in waste water treatment. That’s BaseVac’s first commitment to the environment. A standard water ring pump is an electric motor driven pump that spins water to create suction. The BaseVac is an electric motor driven pump that moves air to create suction. Air is much slighter then water, therefore the load on and electric motor is less when pushing air. The electrical requirements of a dry system are far less than that of a comparable wet system. 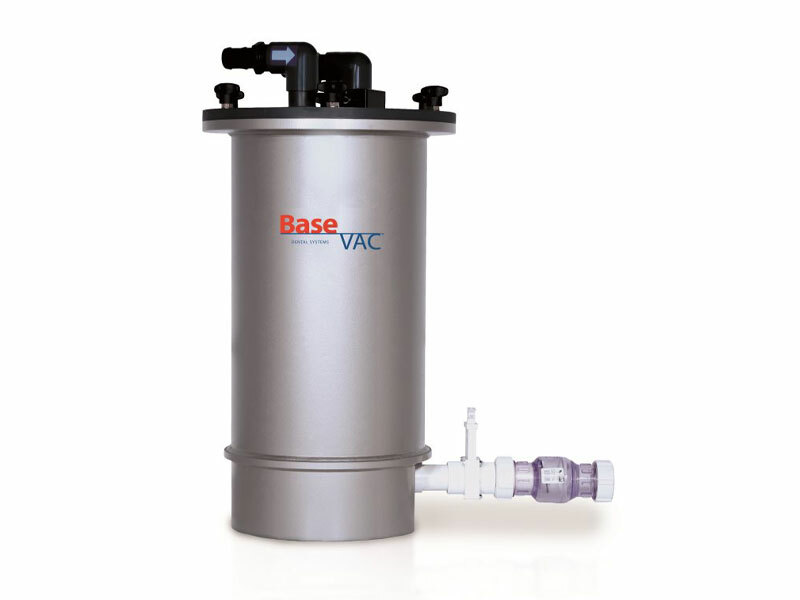 The BaseVac Dry Vac completely eliminates the need for water to create suction. Our oil less, waterless, dry suction system can buy itself in water savings, usually within the life of the warranty. How much does your water vane pump cost you? The average 2 x 2 Hp water vane suction system uses 200,000 gallons of fresh water per year. This is fresh water that is dumped down the drain, and you pay for that too. Besides the negative environmental effects this also comes at a huge monetary cost to dentists every year. To give you some idea of how much this actually costs, below is a table of water and sewage rates in some Canadian cities.